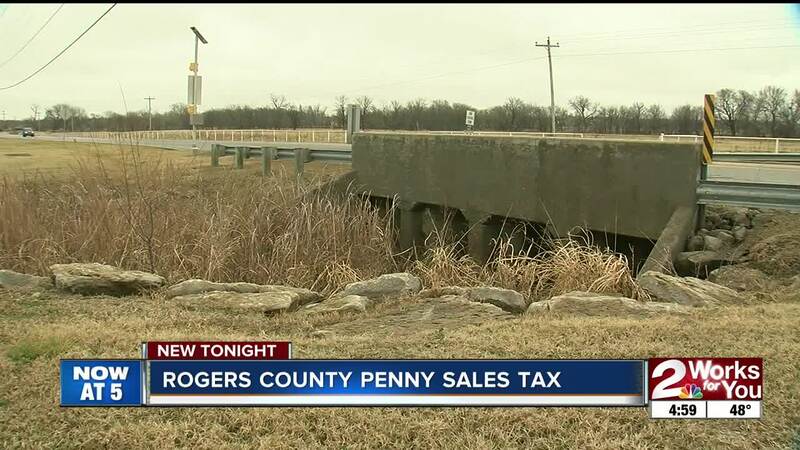 CLAREMORE, Okla. — A penny sales tax is back on the ballot for Rogers County. The tax is used to maintain the county’s roads and bridges. After being voted down in last year’s election, the one cent sales tax is up for another vote Tuesday. Rogers County Commissioner Steve Hendrix was shocked when it didn’t pass in June and believes the question was lost on an overcrowded ballot. "It was worded rather vaguely," said Hendrix. "State statutes have changed over the last few years on what you could say and what you could say on a question ballot and we don’t feel like it was worded very well." The tax was originally voted on in 1988 and renewed every five years to upkeep the county’s 1100 miles of roads and 120 bridges. One bridge near Collinsvile was recently finished in September and it’s something resident Susie Kelsey believes makes a big difference. "They seem to be pretty well maintained, if that’s what it’s going for then I’m all for it," said Kelsey. The tax counts for about two-thirds of each county commissioner’s budget and without it, Hendrix said it would require them to reduce their workforce and eliminate any non-essential services and force them to sell equipment. "Although we’ve repaired and replaced many bridges, we still have a number of bridges that are structurally deficient built back in the 40's and 50's that are too narrow," Hendrix said. "We need to improve the safety of those bridges." The county has not had the sales tax money since last September. If the sales tax passes Tuesday, it will be a permanent tax. Commissioner Hendrix said it can be removed, however, if they ever feel it’s no longer needed. For voting locations, click here .